Prince Charles has launched an attack on the "cavalier attitude" of Britain's architects and town planners. He told a Royal College of Physicians conference how car-focused cities affect rates of obesity, respiratory problems, asthma and heart disease. "When we build badly, it doesn't only affect the health of the natural environment, it affects our own health as well," said the prince. He urged that new buildings be seen as part of a "living language". And he warned against the dangers of architecture being used to make iconic statements or indulge in egotistical ambitions. The prince made his speech at the society's conference on the healing environment in London. He said the UK's built and natural environment had been "brutalised" over the past century. But he was keen to stress how the "notion of healing" should be applied to our natural environment as well as to the individual. "We need to relax our somewhat obsessive preoccupation with treating specific symptoms of diseases in isolation," he said. Instead we need to "look at the whole - the person, the street, the town and city and our natural inheritance - together". 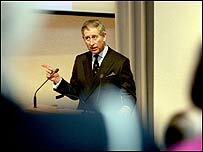 George Ferguson, president of the Royal Institute of British Architects, said: "I agree with Prince Charles' sentiments but, if anything, he's generalising too much. "The architectural profession cares a lot about these issues and he must make allowance for the good things that have happened as well as the bad. The architectural profession cares a lot about these issues and he must make allowance for the good things that have happened as well as the bad. "I believe there has been an enormous shift in attitude within the profession and the trend encouraged by the Royal Institute of British Architects is towards making good places rather than iconic buildings." Part of the address focused on the ways in which good design of hospitals and wards can benefit patients. "Something as simple as the view from a hospital ward may release the need for painkillers and the length of stay for patients who have had surgery." His Foundation for the Built Environment has been working with the NHS to improve the quality of new hospitals. The prince also addressed the delegates about pesticides, conventional medicine and the need "for an understanding of our place in nature". The heir to the throne has long criticised modern architecture. In 1984 he called a proposed extension to the National Gallery in London a "monstrous carbuncle". And his questioning of the usage of modern technology - particularly nanotechnology - has invited criticism from some in the science community. The prince announced his engagement to long-term partner Camilla Parker Bowles earlier this month.